Clearly I'm in the mood to answer questions as I just posted this since I recently found the loverly Lauren's blog! 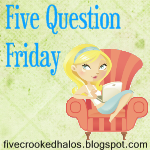 If you're familiar with this corner of the blog-o-sphere then you know that today is the day we all hop on over to Mama M's and play 5 Question Friday!!!! 1. Would you ever vacation alone? sure. but who would I talk to when something funny happens? the locals? I'd like to think I'm that cool but when it comes down to it....I need a side kick. Unless you're talking about an all expense paid trip to Target Great land. Then I'd happily go alone. 2. Do you go the speed limit? depends on what it is and where I'm going. for the most part yes. but everyone out here drives 15miles above what's posted so no worries right? 3. Why did you start blogging/following blogs? last year - march to be exact. I discovered the world of blogging thanks to my friend Rachel and Facebook and began my own shortly thereafter. I've been hooked ever since. Like a crack addiction except less expensive and I get to keep my teeth. 4. Where do you shop for yourself? any and everywhere truthfully. If it's cute I don't discriminate. i love love love Nordstrom (regular retail location and the Rack) but it's not always in my price range so I make do with H&M, Forever 21 ,Hautelook.com and Target for good measure. You never know when you might just find a FAB deal!!!! 5. What was the song that you danced your first dance with your spouse to at your wedding...or...what song would you like your first dance to be to? well since we are to be married in 178 days I guys I should get on that huh? okay I'm done with the Q& A ...go ahead and link up and play along!